Since the first European settlement of Australia, production of cereal grain for local consumption and export has been threatened by fungal rust diseases. Currently three species of rust fungus infect wheat, the major Australian export cereal crop. In 2009, it has been estimated that in the absence of control of these diseases, losses in wheat production would be approximately $1.5 billion dollars per annum [see Murray & Brennan, 2009]. Rust control relies on the use of fungicides and on breeding rust resistant wheat varieties that contain one or more genes conferring rust resistance. In a research program beginning in 1982, Dr Jeff Ellis and colleagues from CSIRO’s Division of Plant Industry have made major contributions to our understanding of the interactions of plants and pathogens. They have identified the two key genes that determine whether plants are infected by rust fungi, a devastating crop disease which in epidemic years causes yield losses in cereal crops which can threaten world food security. The CSIRO program spans the R&D spectrum extending from fundamental research into the flax plant model system ‘ with long-ranging outcomes ‘ to applied research with immediate applications in cereal crops, such as wheat. In recognition of his outstanding contributions to the field Dr Jeff Ellis was elected a Fellow of the Royal Society in 2009. Since the 1920s the major research, aimed at identifying and deploying rust resistance genes in cereal breeding programs and in understanding virulence and population dynamics of cereal rust fungi in Australia, has been carried out by The University of Sydney. However in the early to mid 1980s CSIRO Plant Industry became involved in rust research with the aim of understanding the molecular basis of rust resistance in plant hosts and the molecular basis of virulence of rust fungi. This required cloning plant rust resistance genes and a class of avirulence genes in rust fungi. Initially CSIRO focused on two ‘model’ systems, the interaction of maize with maize rust (Puccinia sorghi) and the interaction of flax with flax rust (Melampsora lini). These were chosen because of the extensive background of ‘classical’ genetic characterisation of these interactions. In recent years, projects have been developed that work more directly on rust resistance genes in wheat and on avirulence genes in wheat stem rust. Two developments in the early 1980s opened the way for successful rust studies in CSIRO. The first was the cloning in the United States of the DNA transposable elements (‘jumping genes’) of the Activator/Dissociation (Ac/Ds) system in maize, which had been originally genetically characterised by Nobel Laureate Barbara McClintock. Cloning of these elements allowed the use of the process of transposon tagging, (already successfully used in bacteria for identifying important genes), to be applied in maize to isolate genes mutated and tagged by insertion of the transposable element. In CSIRO, Tony Pryor applied this new technology in an attempt to tag and clone the genetically characterised Rp1d rust resistance gene from maize. The second development required for CSIRO’s rust research program was Agrobacterium-mediated genetic transformation of plants and the subsequent demonstration by a German group that the cloned maize Ac element transposes in transgenic tobacco, thus allowing the Ac/Ds transposon tagging system to be moved into other plant species that could be transformed. A CSIRO group made up of Jeff Ellis, Greg Lawrence and Jean Finnegan initiated a project, with the support of the Chief of Plant Industry, Jim Peacock, for tagging rust resistance genes in transgenic flax with Ac. The flax group was successful, in 1994, in tagging and cloning the L6 rust resistance gene and was a joint winner in an international race to isolate the first plant disease resistance genes encoding a new class of immune receptor, the nucleotide binding site-leucine rich repeat (NB-LRR) resistance proteins. This protein class has since also been identified in mammals where it plays a role in innate immunity. Interestingly, this is one of the few pieces of pioneering molecular biology where plant work preceded mammalian discoveries. Together with the other groups in plant immunity research, it was discovered that resistance to many different plant pathogens including fungi, bacteria and viruses, were controlled by the NB-LRR receptor class. The design of a process based on the polymerase chain reaction allowed large numbers of different members of this group of genes to be isolated from plant genomes. This process was then applied to assist in isolating the Rp1d rust resistance gene from maize. Tony Pryor had shown genetically that he had been successful in tagging Rp1D with the Ac/Ds system. However the situation was complicated because the tagging was done by insertion of a Ds transposable element rather than an Ac element. The problem stems from the fact that Ds occurs as 50-100 copies in the maize genome in contrast to Ac, which occurs at low copy number (5 or so copies). This complexity made it difficult to identify the one of many Ds elements associated with the tagged Rp1d mutant gene. However, Nick Collins using the ‘redundant’ PCR technique developed from the flax work, identified 20 or so different maize NB-LRR gene regions. One of these, the 20th in fact, identified a maize NB-LRR gene identified as the Rp1d rust resistance gene. 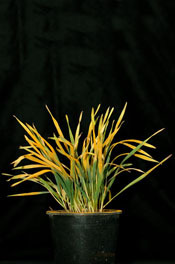 This gene was interrupted by a small Ds insertion in the Rp1D tagged mutant and uninterrupted in a wild-type revertant of the mutant that arose through subsequent transposition of Ds out of the gene and was the first cereal rust gene to be cloned. In the 1990s the Plant Industry group turned their focus more towards the rust pathogen. Classical genetic analysis of the interaction between flax and flax rust had established the ‘gene-for-gene’ hypothesis, one of the cornerstones of modern plant pathology. The genetics had established that for each flax resistance gene, there was a corresponding gene in the rust for avirulence. In other words, a flax plant was resistant to rust only when two conditions were met; the plant carries a resistance gene and the infecting rust fungus a corresponding avirulence gene. Over 30 such gene pairs had been identified and the exquisite specificity of the host-rust interaction suggested a receptor-ligand type of interaction. In 2004, Peter Dodds isolated the first flax rust avirulence gene AvrL6 that ‘matched’ the previously cloned L6 resistance gene from flax. The Avr gene is highly polymorphic in the genome of different flax rust isolates and encodes a small protein that, after secretion from the rust fungus during infection, is then taken up across the plant host cell membrane and triggers an immune response in the plant cell cytoplasm. He was also able to show for the first time that the resistance protein and the avirulence protein did interact directly as predicted by the ‘gene-for-gene’ hypothesis with the specificity of the interaction determined by specific amino acids in the leucine-rich repeat of the flax L6 resistance protein and the polymorphic surface of exposed residues on the avirulence protein. In collaboration with crystallographer Bostjan Kobe at the School of Molecular and Microbial Sciences, University of Queensland, Brisbane, the crystal structures of two members of the AvrL567 family of avirulence proteins has been determined and a model of the possible nature of its interaction with the flax resistant protein L5 produced. At the time there was no structural information available for any plant NBS-LRR protein and the proposed structure of the leucine-rich repeat (LRR) domain of L5 was modelled by comparison with internalin A and other LRR proteins. The next questions to be addressed are how the avirulence protein, secreted by the externally located rust fungus, enters the host plant cell; what is the postulated virulence function of this rust protein in the absence of a host resistance protein and whether this information will enable scientists to engineer a suite of synthetic rust resistance genes for long lasting and effective genetic control of rust diseases in important crop species such as wheat.